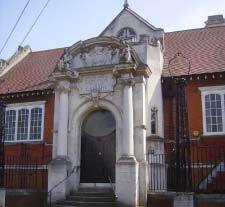 Situated almost in the centre of the park, on the one road which cuts right through, the library was built together with slipper baths and washhouse in 1903. The facilities were updated several times, but as the local population dwindled from the 1960s onwards with the creation of the park, the building closed some time in the 1980s. For more backkground, see our history page. It’s still owned by Southwark Council, is Grade II listed, and parts of it are occupied by Lynn Boxing Gym and a church, but it’s somewhat under-used. We think it has great potential, and have been working on a project to bring it back into full use as a Park/Community facility. We’ve set up a group of people meeting regularly to look at possiblities for the long-term future – all are welcome to join us. We’ve had 4 or 5 meetings so far. Watch this site or email us for details of further meetings. Tell FOBP your ideas for the future use of this Victorian landmark building in Burgess Park! We successfully acheived a listing for the whole building as an Asset of Community Value in February 2014. (Scroll to ‘Community Asset application Passmore Edwards library, bath and washhouse’ on our main website page, to read the documents.) We then lobbied the Council to let, on a short term basis, the Library section which had stood unused for 8 years or so. The Library was let, from Sepember to December 2014 to March 2016, to Just Jones& who operated a successful pop-up space there. Since July 2016, the Library has been let to Theatre Delicatessen who are using the space for all kinds of creative performance work with the local community. Check out their website and support their events! FOBP, with permission from the Council, opened the Library section of the building in September 2013, 2014 and 2015 for London Open House weekend. It was a great success, and an average of 600 people took these rare opportunities to see inside the Passmore Edwards library, as well as the baths, wash-house/laundry and basement. More information on the main Friends website. The Library made a fantastic space to show the Picture Burgess Park photographic exhibition in 2013, alongside historical pictures and maps about the library and the canal. At the 2014 event, we had a display of Passmore Edwards background information (many thanks to Dean Evans for coming from Cornwall with this), as well as more historical information and maps. In 2015, Just Jones& demonstrated their ideas for the popup, and visitors contributed a whole lot more ideas for the building’s future. Friends of Burgess Park thank Southwark Council for opening up the use of the building and allowing us to hold events there, which have contributed to our wider Bridge to Nowhere project about the history of Burgess Park, especially during Zeppelin 1917.